Sonic Drilling – Sonic drilling is a safe, clean and low-impact drilling technique. Boreholes are drilled, cored and cased by rotating and vibrating the rod, core barrel and casing at resonant sonic frequencies. Sonic drilling generates considerably less drill spoils than auger, mud or air rotary methods, saving additional project resources. Sonic drilling is outstanding in its ability to provide continuous, undisturbed core samples through any geological formation. Air Rotary – High-flow air is injected through the drill string, cooling the bit, evacuating rock cuttings from the borehole and stabilizing the borehole during drilling. The air-rotary technique is much more efficient than other rock drilling techniques (i.e. cable tool) because the high-flow air constantly cleans the bottom of the borehole, which allows for consistent contact between the drill bit and intact bedrock. The size of the air compressor and borehole determine the achievable depth, since the compressor must maintain an uphole velocity of approximately 3,000 feet per minute to effectively remove the drill cuttings. In bedrock formations where cuttings removal is more difficult, foam can be added to the injected air to increase the viscosity and help lift cuttings from the borehole. Air rotary drilling is the ideal method for advancing boreholes in consolidated bedrock formations. Hollow Stem Auger – For normal hole advancement, a pilot bit is inserted through the cutter head to drill the center of the hole. The drill rod is bolted to the inside of the drive cap with a rod-to-cap adapter so that the pilot bit can turn in tandem with the augers. This method allows for split spoon sampling, Shelby tube sampling, Dennison sampling, Hydropunch discrete water sampling, and rock coring to be performed while leaving the augers in place. Drill rods are normally added each time an auger is added. In soft formations (dirt and sand), a tapered wooden plug may be inserted into the end of the cutter head to prevent material from going up inside the augers and eliminates the use of drill rod. When the hole is completed, the plug may be knocked out the bottom of the auger string. The next step is to insert the monitoring screen and casing, which is then grouted into place to prevent contamination from the top of the hole. Hollow stem auger drilling is the ideal method for advancing shallow boreholes in unconsolidated formations especially when soil sampling is required during the advancement of the borehole. Mud Rotary – Drilling mud is injected through the drill string, cooling and lubricating the bit, carrying the cuttings to the surface to be deposited in either a mud tub or pit, permitting the removal of the cuttings from the mud at the surface. The drilling mud will clean out the bottom of the borehole, deposit an impermeable wall cake, overcome formation fluid pressures, and prevent caving of the borehole walls. The drilling mud will avoid damage to productive water zones, allow for interpretable electric well logs to be obtained, and protect the drill pipe against corrosion. Mud rotary drilling is the ideal method for advancing deep boreholes in unconsolidated formations. Geoprobe/Direct Push – Direct push technology includes several types of drilling rigs and drilling equipment which advances a drill string by pushing and/or hammering without rotating the drill string. While this does not meet the proper definition of drilling, it does achieve the same result – a borehole. Direct push rigs include both cone penetration test (CPT) rigs and direct push sampling rigs such as Geoprobe. Direct push rigs typically are limited to drilling in unconsolidated soil materials and very soft rock. 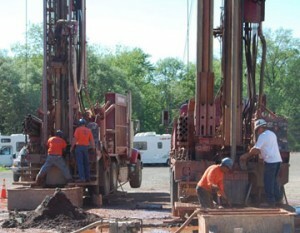 Direct push drilling rigs use hydraulic cylinders and a hydraulic hammer (with a nitrogen load) to advance a hollow core sampler to gather soil and groundwater samples. The speed and depth of penetration is largely dependent on the soil type, the size of the sampler, and the weight and power the rig. Direct push techniques are generally limited to shallow soil sample recovery in unconsolidated soil materials. The advantage of direct push technology is that in the right soil type it can produce a large number of high quality samples quickly and cheaply, generally from 150 to 300 feet per day. Rather than hammering, direct push can also be combined with sonic (vibratory) methods to increase drill efficiency. Direct Push is widely used for less intrusive activities, often collecting vast amounts of soil and groundwater data with minimal time and intrusion on properties and soil/groundwater conditions. Direct push is also used to inject a wide variety of remediation chemicals into soils and groundwater.